This Dakota the Cow giant wall decal is a delightfully red flowered cow from the fun and funky ZooWallogy peel and stick mini mural collection. 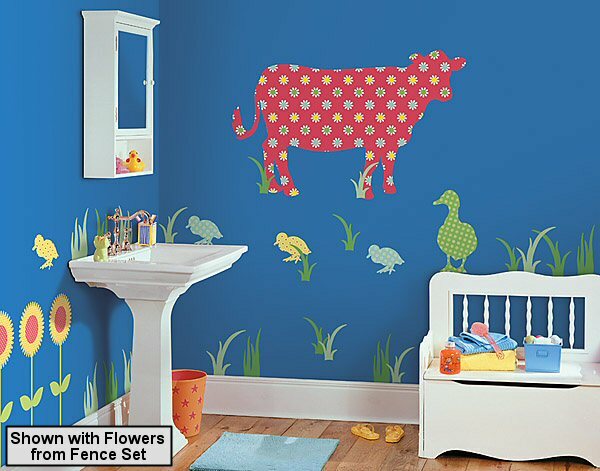 Accompanied by a mama duck, 4 baby ducks, grass, and a couple leaf sprigs, this peel and stick Dakota the Cow ZooWallogy wall mural set will help you create a fabulous farm scene in a snap! ZooWallogy giant wall decal sets are all about "ginormous" animals in bright colors and oh-so-funky vintage inspired retro prints. Just peel and stick this fun Dakota the Cow and accents and you're on your way to creating an amazing ZooWallogy scene in minutes for just about any room in your home. Cow 35.75" x 22.75"; Mama Duck 6" x 11.25"; Baby Duck 5" x 4.5"; Small Grass 4" x 5"